Let’s Go To Summer Camp! At Camp Lincoln, programs for younger campers are more structured while older campers have more choices about the activities in their day. Traditional day camp activities include swimming lessons, arts and crafts, archery, sports, and more. Specialized camps for older campers offer the choice to participate in off-site activities such as golf or horseback riding. Campers, from ages 11-15, can also participate in 5-day overnight adventure camps throughout New England, from Cape Cod to the White Mountains, and beyond to Quebec City. YMCA Camp Lincoln offers a variety of affordable summer camp programs with transportation and expanded camp times for working families. No camper has been turned away for inability to pay in 89 years. Scholarships are available for campers in need. 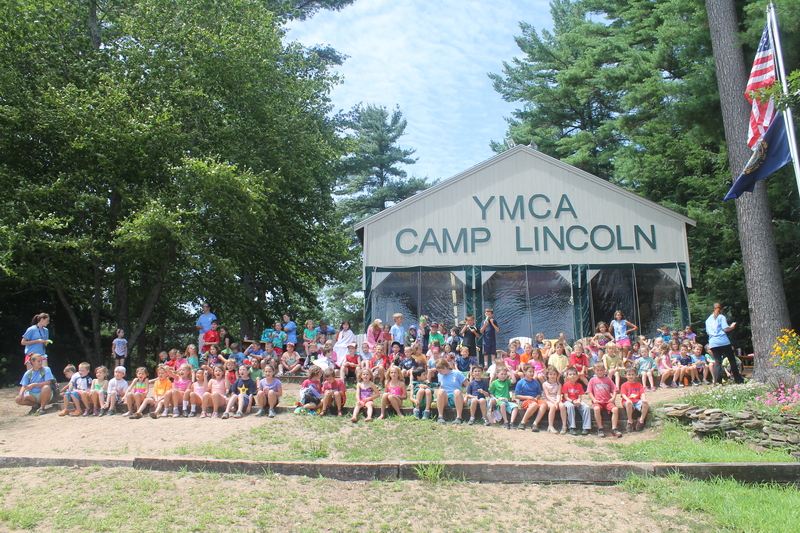 Online registration for summer camp at YMCA Camp Lincoln is open and filling quickly! Since 1926, campers have developed friendships, discovered new talents and built self-confidence at YMCA Camp Lincoln. Families with children ages 3 to 15 can learn more about a day at camp – and register – on our website. My Y story begins like this; a wintry night, a movie night, and a late arrival during the college winter break. My daughter’s good friend was late to our house for the gathering because she had been at an interview for a position at Camp Lincoln. She oozed enthusiasm about the camp. I mentioned that since Sarah had secured a job there, it would be great for Kayla to apply as well, in an effort to help with college costs. We felt that eating tuna casserole five nights a week was becoming intolerable. Being quiet and reserved, my daughter immediately focused on the dreaded interview, which meant that she would have to talk to a “stranger” (I may have drilled that to the core in childhood.) Nonetheless, I forced her to call Camp Lincoln the next day to arrange for an interview, thus negating a full day of holiday spirit. She wanted the job, just not the interview. Silence on the way over on her part, and “helpful” interview tips from mom. We left an hour early. We arrived at beautiful Camp Lincoln 40 minutes early. We sat. Finally, with 20 minutes to go until the interview, I told her to go in. She refused. I cajoled, demanded, begged, and, finally said, “Get out of this car now!” I was reminded how mean I was with a slamming of the car door. She was hired. She left our house every morning an hour earlier than her start time. She loved the activities and the kids. She taught responsibility, kindness, and the value of teamwork. She learned how to have and love a job. Above all, Camp Lincoln reinforced what we had taught her over the years, and she passed it on and blossomed. I cried at the first Family Night at camp, and at the night that she was named Counselor of the Year. Camp Lincoln had turned my child into a mature young woman. She looks forward to going back for her third year. 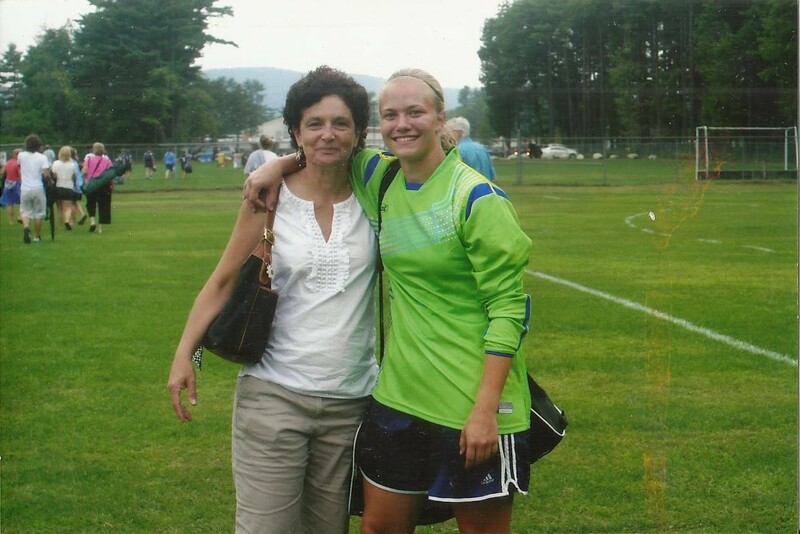 Sandy Janowski is a Camp Lincoln parent from Stratham, NH who also volunteers her time for Southern District YMCA. 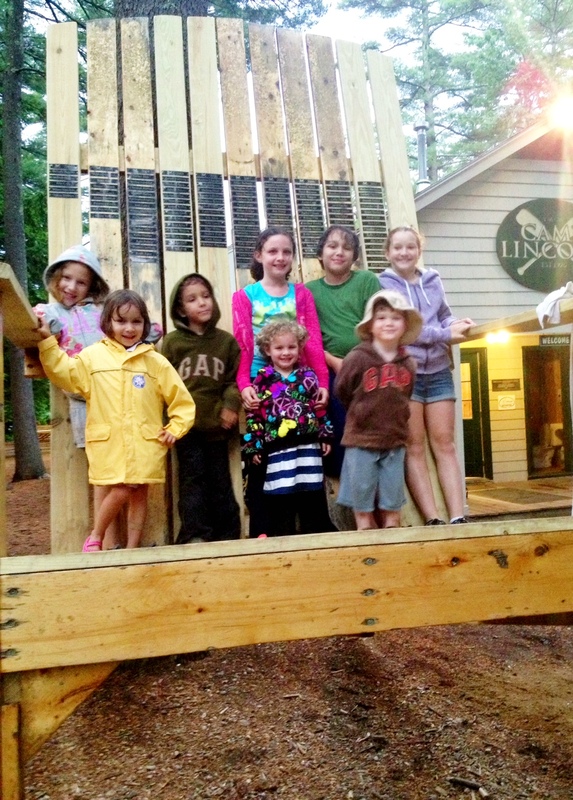 Camp Lincoln’s 87th summer was a huge success. Almost 5,000 camper weeks were accumulated this year. Over 1,400 campers attended. Campers learned how to swim, shoot arrows, play games, make friends, lead groups, gain confidence and have fun! Thank you to all our campers and families for the enthusiasm and energy you brought to Camp Lincoln this summer! To the Camp Lincoln summer staff, you made this summer memorable for so many campers. Remember your goals, your ambitions and the friends you have made. Camp Lincoln would not be the same without you – you have helped make us stronger. Thank you. YMCA Camp Lincoln was a sea of color yesterday as campers and staff wore team-unit colors that corresponded to the YMCA core values. Caring, Honesty, Respect, and Responsibility were the name of the game as campers competed in a variety of color-themed events. 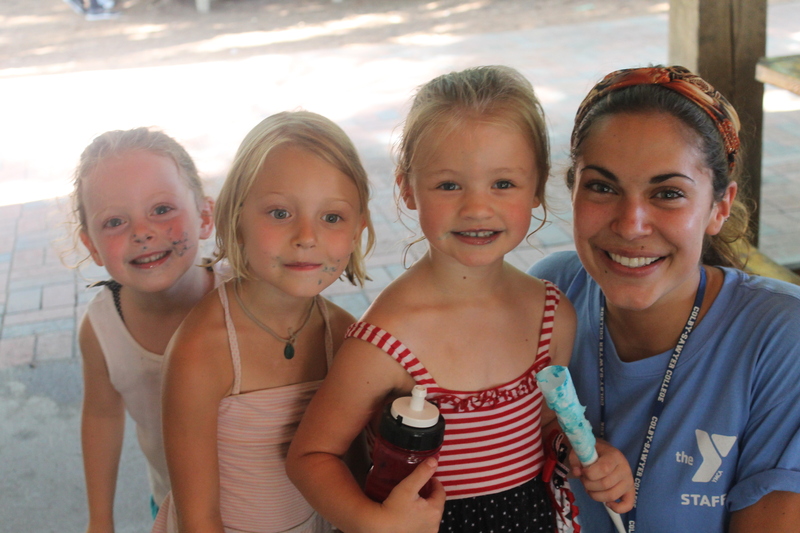 Spirit week is a high point of a Camp Lincoln summer, and it doesn’t end with Color Day. Other special days include Superhero Day, Celebrity Day, Mix n Match Day, and Career Day. Wow- what a week! Enjoy these photos from Spirit Week! And remember you can stay up to date with daily camp photos on Facebook. My Y story began far after I was of the age to canoe at summer camp or enjoy an after school arts programs. It began on October 30, 2007—the day my then 6-year-old son, Jacob, was diagnosed with Type 1 diabetes. It was Halloween in Exeter. While kids were applying face paint and donning outlandish costumes, Jacob and I were in an ambulance headed to Children’s Hospital in Boston. After a week-long hospital stay, we went home. Prescriptions and instructions in hand, we began educating our family, friends, schools—everyone who had contact with Jacob in his day-to-day routine. They became part of Jacob’s team—embracing the opportunity to support him and us as we settled into Jacob’s new lifelong reality. The months flew by, and the New Year began. We had a great team caring for Jacob, and he felt safe and trusted those around him to help him in managing his disease. And, as the summer camp registration forms began to roll in, he looked forward to spending a summer outside exploring. I stayed close to home when choosing a program—I work from home part time, so I can easily help in Jacob’s care. By mid-February we had chosen a program. It was close to home and promised lots of outdoor exploration. One more call to finalize details and we’d be set—or so I thought. After a month of discussions about Jacob’s care and my willingness to be available at a moment’s notice, the program’s Board decided that they weren’t prepared to care for Jacob. My heart sank. Summer programs were filling up and this program had seemed ideal. I hung up the phone and began searching online for more options. SDYMCA/Camp Lincoln came up. I had heard about it through a friend, but I hadn’t considered it an option: Kingston, after all, is 15 minutes away, at best—outside of my comfort zone at the time. And was I emotionally ready for weeks of discussions with another program to convince them that we’d work together to keep my son healthy and safe? I vaguely remember the other details he shared—full-time camp nurse; great, responsible counselors; etc., but I didn’t need the details. “We’ll take care of him” were the words I hung on that day. They were the words I needed. Jacob is now 12. He’s attended Camp Lincoln since the summer of 2008. And while it was Jeff’s simple statement that convinced me to sign up, there are far more things that have kept Jacob, and now his younger sister, Annelise, returning year after year. For them there have been mountain biking camps, cooking camps, epic card games, spirit paddles, counselors that remember them year after year and whom they are genuinely sad to leave at the end of a session. For me there have been thoughtful, attentive camp nurses and counselors, and the witnessing of Jacob take increased responsibility for his care in an inspiring, confidence building setting. But even more than this, what I’ve most appreciated is SDYMCA/Camp Lincoln’s sincere willingness to be part of our team. The wet weather didn’t stop more than 15 families from enjoying an evening at Camp Lincoln during the first of three Community Nights this summer. Children and parents tested their focus at the archery range, learned how to put on a climbing harness, and scaled up a slick rock wall before grabbing their towels and heading to the waterfront for swimming, paddle boarding, canoeing, and kayaking. It’s hard to say if any adults actually went in the water last night, but many kids were splashing, laughing, and practicing their swimming strokes. Camp Lincoln staff grilled burgers and dogs; some families took a break to sit and enjoy dinner, while others grabbed a quick bite between activities. Despite the drizzly weather, the energy and excitement for playing at camp was undeniable. Mark your calendars, and invite your friends, for the next Community Night on Tuesday, July 23, 6-8 pm. Thanks to some generous volunteer groups, Camp Lincoln is in great shape, and almost ready to welcome thousands of campers this summer! 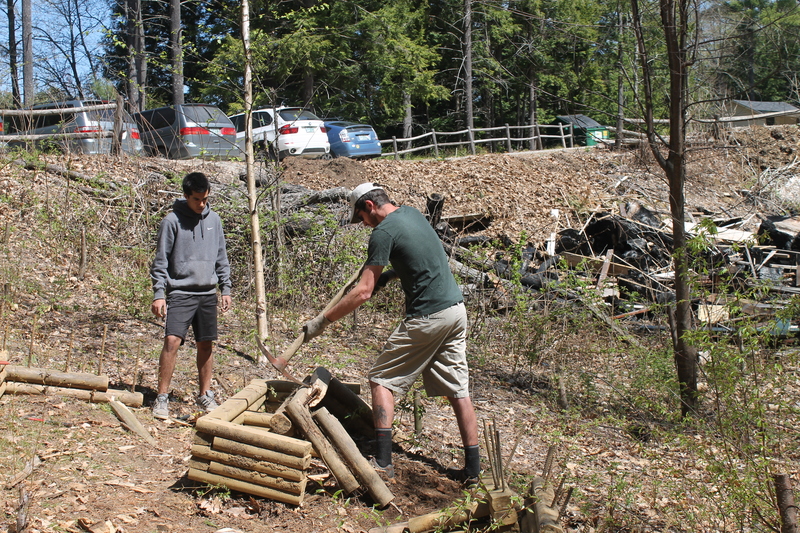 Fifteen staff and their family members returned to camp on Saturday to move firewood, paint signs, and rake and sweep cabin roofs. Docks are back to their floating positions on the lake. On Friday, the office exteriors will be painted and camp’s token Adirondack Chair will get a structural makeover. Thanks to all these volunteers! On Sunday, over 300 families attended an Open House at camp to tour the facilities and talk about summer camp with staff. Thank you to the eighteen staff members who helped out at the Open House!